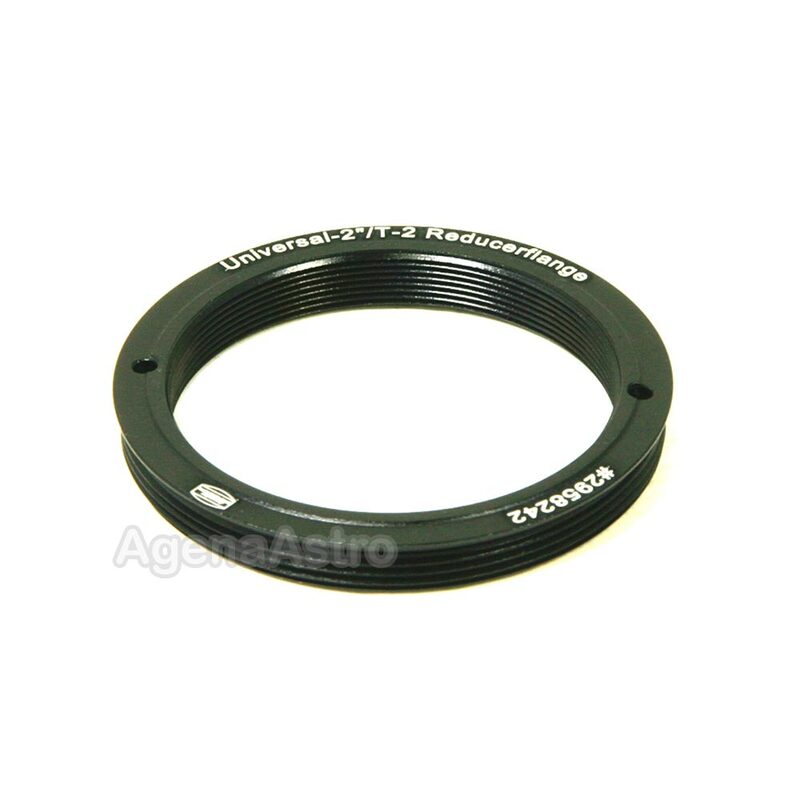 This expanding ring converts a T-2 female thread (M42x0.75) to an SCT male thread (2"x24tpi). 1mm optical path length. Baader officially refers to this product as a Baader T-2 to 2" Thread Expanding Ring. However, we find this title confusing and prefer to call it a T2 to SCT ring. While the SCT thread is technically a 2" thread, most amateur astronomers usually mean the M48 thread (that is smaller than the SCT thread) found on most standard 2" eyepieces and accessories when they refer to a 2" thread. Review by KC of RI. Decent product, solid construction, accurate specification as to be expected from Baader. The thread width could be a little more than 1mm. 2mm would have been better as most SCT threads are about 1.5mm deep. My SCT thread bottomed out and left my diagonal mirror loose. I managed to cut some plastic from milk bottles in the correct diameter circles to use a shim/washers between this piece and the SCT thread female end to fill the gap so the diagonal mirror would be tight. Baader, consider a 2mm thread depth. Review by Flash of New York, NY. 5.0 Agena Astro Products Was Great! Review by Randy1s of Dearborn Heights, MI. I just needed an adapter to connect my off-axis guider between the filter and camera.